12FOOT3 » Blog Archive » Naoshima: Oh the pictures I could have taken here! Naoshima: Oh the pictures I could have taken here! It’s hard to know what to do after a family member’s death, especially when you’re traveling. It doesn’t feel right to dwell on the event, but it doesn’t feel right to just move on to the next town, either. In this way, I feel like Jeremy and I were blessed to be in Japan during Grandpa Bob’s passing. The country is so peaceful that it promotes a meditative quality in it’s visitors (at least, it did for us). Being in Shirahama during Grandpa Bob’s passing was really the second best place on earth we could have been (other than by his side)…something about looking into that deep blue ocean horizon allowed us to process the event and come to terms with our feelings about his death from afar. And our next stop had a similar replenishing effect on our spirits: Naoshima, a small, sleepy island between Honshu and Shikoku, is known for being a public space dedicated to contemporary art. What better way to replenish the soul than to sleep on the beach (in Mongolian yurts, no less), and wander around a sleepy fishing village searching for public art installations? 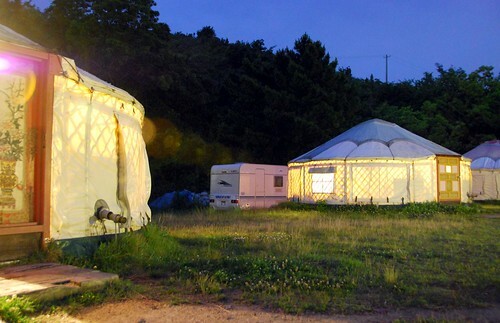 Tsutsuji-so yurt village at night, a Mongolian pao encampment on Naoshima’s swimming beach. 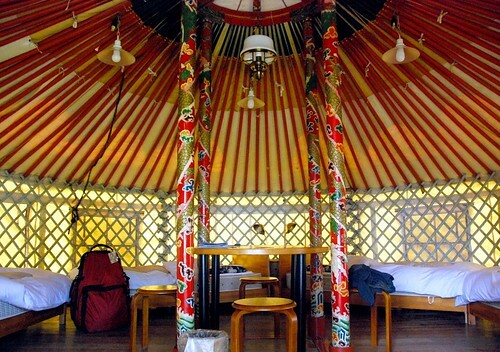 The interior of our yurt. The way that Naoshima expresses its artistic dedication is threefold. First, there are public artworks that can be found all around the island. 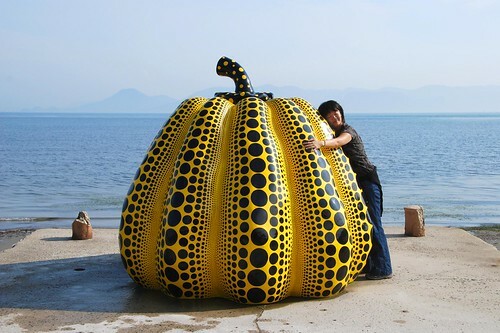 Our absolute favorite was “Pumpkin” by Yayoi Kusama. It was set up on a dock off the swimming beach, and if the tide is high enough, the dock gets swallowed by the waves, making the pumpkin look as if it is floating on the water. We weren’t the only ones who loved “Pumpkin.” All day long, kids and adults alike were wandering by, marveling at the piece and leaving with huge smiles on their faces. I’ve seen work by Yayoi Kusama before (easily recognizable by the polka dot theme throughout her work). Even though her pieces tend towards this Pop-y aesthetic, the roots of her work are actually quite dark. Read more about her on Wikipedia: she’s really quite fascinating. The interior of Haisha house is also super funky (there is a giant white replica of the Statue of Liberty in one of the rooms). Though the house is visually striking, I am finding myself unimpressed with artwork these days unless it provokes an emotional response. This is something I am reaching for in my own work (not always successfully, but I’m working on it), whether that ideal is expressed through design, or photography, or even textiles. So I sort of ended up walking through Haisha house and marveling at all the stuff, but not really feeling a cohesive message or emotional connection to the work. 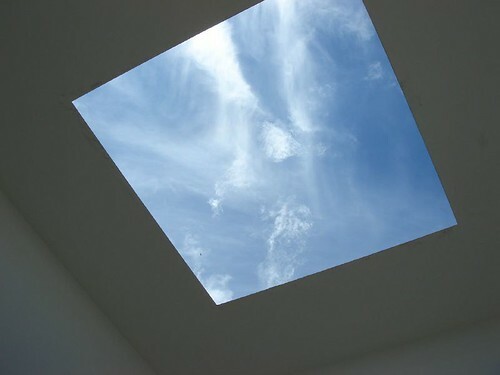 One piece that did provoke a more visceral response was “Backside of the Moon” by James Turrell. The building itself was essentially a rectangular box (Japanese minimalism at it’s best) designed by Tadao Ando (I think the building is considered a separate work of art entitled Minamidera). You are led into the pitch black space, and you sit there for about 8 minutes until your eyes adjust to the darkness. After your cones get used to the blackness, a rectangle of light appears in the far wall of the building, and you are allowed to walk towards the light from the back of the room. I found the experience quite interesting, because in the darkness, your depth perception gets thrown completely out of whack…you cannot discern how far away the back wall is, and you can’t feel the size of the space either. Jeremy was rather unimpressed with the piece, but I found it quite powerful. When else are you forced to engage with a work of art like that? When was the last time a piece instilled the opposing feelings of peace and fear in you? 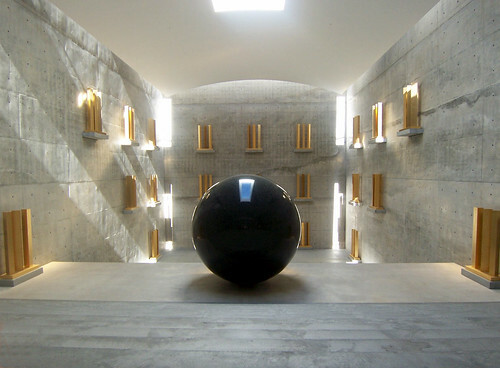 The final and most impressive way in which Naoshima dedicates itself to contemporary art is through it’s museums. 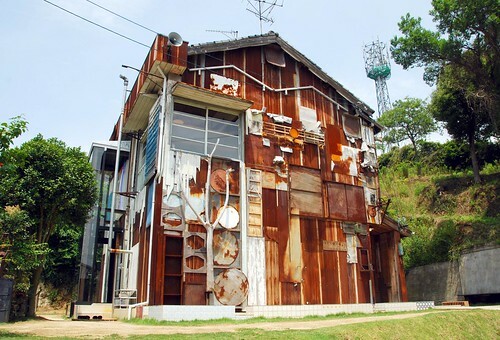 There are two on the island: Benesse Art House and Chichu Art Museum. I’m not going to talk much about Benesse House, because Jeremy and I weren’t very impressed with the work there—though it is worth mentioning that you can actually stay at the museum if you’re looking for a way to spend US$500 per night: the upper floor of the galleries is a fancy hotel, with original artworks in each room. On the other end of the spectrum, Chichu Art Museum is, hands down, the most fantastic museum I’ve ever experienced. It is the most cohesive expression of nature, art, and architecture I’ve ever seen. Again, no photos were allowed in the museum (”Oh the pictures I could have taken in Naoshima!”), but I’ll do my best to describe it along with some photos I’ve found on Flickr. 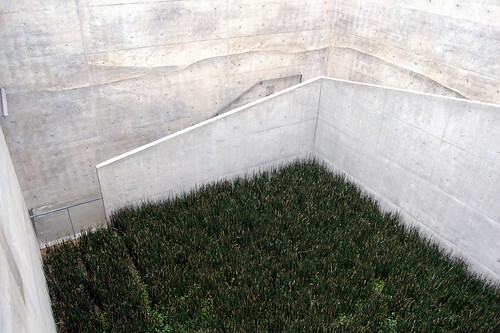 First, the building itself: Tadao Ando designed a super sleek, modernist concrete building into the side of a mountain. You might think that the minimalism of modern architecture would be too severe against the beauty of the Japanese countryside, but the architect has managed to instead create these indoor/outdoor spaces where the building is framing, rather than containing the nature around it. 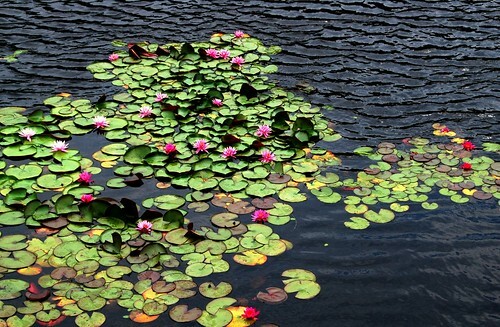 Second, the artwork: there are only 9 pieces in the entire building (not counting the building itself) made by 3 different artists: Claude Monet (5 paintings from the Waterlilies series), James Turrell (3 pieces), and Walter de Maria (1 installation). The Monet paintings are the only pieces not made specifically to be housed in the building, but in the case of this artist, the building was made to house the Monets. 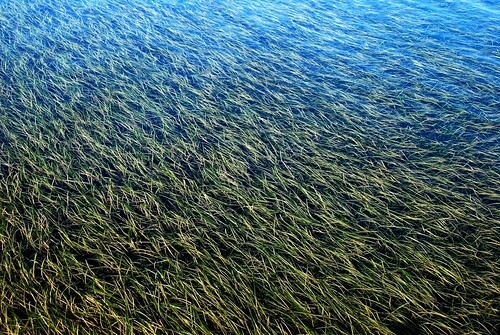 Now, let’s get one thing straight: I like Monet just fine, but I wouldn’t say that I am excited by his work. But I literally gasped when I walked into the Waterlilies room. Ando has planned it so that as you walk into the space, the largest painting is perfectly framed between two non-load bearing walls. Now THAT’S what you call good interior design: predicting the way a visitor will move through the space, and then rewarding them when they do as you expect. Though the museum is all underground, the rooms are still it by natural light. There is enough space within the gallery so that you can stand far away from the massive paintings, and yet you can also walk up close to observe individual brushstrokes. Ando was clearly a huge fan of the Waterlilies series to treat it with this level of respect. For the first time ever, I witnessed a gallery elevate a piece of art, rather than receding to the background. Any artist would be thrilled to have their work treated with this kind of sensitivity and reverence. Though it might not look like much in the photo, the beauty of this piece is that it is constantly changing. Light shines in through the skylight and reflects off the gold bars along the walls in different ways according to the position of the sun. As the viewer walks through the room, s/he is reflected in the large black ball in the center of the room, creating a lovely fusion between the observer and the observed. Again, nature, art, and architecture work together to make this piece. Without one, there cannot be the others. Wandering around Naoshima truly replenished our spirits. Though not technically an earthwork, this little island in the middle of the Seto Sea accomplishes what the best earthworks intend to do: force the viewer slow down, observe, and contemplate the way in which humans can elevate our experience of nature. Bravo, Naoshima! I want to be where you are. Even thought the art is a bit more modern and stark than I usually take to, that the art is so much a part of Naoshima is fascinating. Fabulous pictures. Uhhhhh….I’m going to cry with jealous eyes. I’m heavy with envy. What a great post too, you really took me there. I can feel your emotional connection by reading this post. Now I’m convinced that the 3 year long art school was a tremendous investment for your spiritual well being.